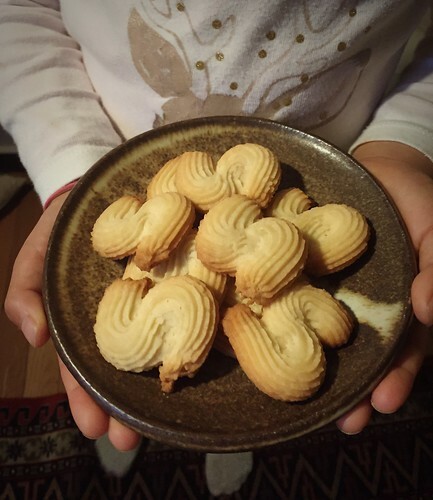 Viennese sablé cookies – Come on in, I hope you are hungry! *What do I say a lot? 6-year-old: I give cards to you. 4-year-old: I give you gifts. 4-year-old: Not giving you gifts. *What is my favorite thing to do? *Where would I go if I could go anywhere? *Could you live without me? *What do I do to annoy you? 6-year-old: You give me things I don’t like, like broccoli. 6-year-old: I spy with my little eyes. *What is my favorite music? *How much do you love me on a scale of 1-10? 6-year-old: 10 because 5 is medium. So this is one of those things that you can ask you kids and have fun! Note: Everything has to be at room temperature, otherwise it will be a pain to pipe your cookies. Use handheld mixer to beat butter until puffy and pale yellow. Add sugar and salt, beat until well combined. Add vanilla extract and egg white, beat until combined. Use a spatula to fold sifted flour into egg butter mixture. Transfer batter into a pastry bag fitted with a large star tip. Pipe on lined baking sheets any design you prefer. The standard ones are round, S or W letter, star, and flower.